Honestly terrorized! Portfolio reviews! Finding the way! Not getting lost! Make everything in time! Bring enough copies! Aaargh! I've been lacking in updating every Thursday news of the Endling, but this is a big one, and the few people who pass from here probably know that already. The weekly publication of the Endling on Thrillbent.com had almost reached the production, so we had to make calculations and decide to take a break, so we could stack a decent number of chapters before starting publishing again. So the production hasn't stopped: I've sent the last pages for Issue 22 right this morning, I'm preparing the bonus material for Collection #3 and working proceeds as usual. We will be back online at the end of January. In the meantime, please join the Endling on facebook or on Twitter to keep up with updates! The second, necessary update is that I'm coming to New York! 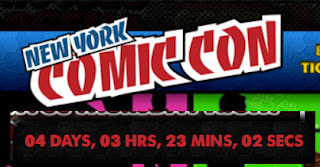 I'll be touring the NY Comicon in company of a very good friend, and hopefully we'll see something of the city as well. We are organizing with other Thrillbent authors, to see if we can recognize each other in first place, and then eventually do something. We'll keep you informed!